What is the future of the drone? As amateur photographers and filmmakers, will we still have access to this technology in 12 months time? Oat’s 2014 Showreel from Oat Vaiyaboon on Vimeo. Oat Vaiyaboon, Port Fairy Thai Chef, Photographer and local DRONE/UAV/UAS/MULTIROTORS specialist ran a workshop on aerial filmmaking for the Snapshots Project in Peterborough. I invited him along to run this session because I love his work and because I would like to see aerial photography as part of Peterborough’s Collaborative community film. Oat showed us some beautiful examples of his work and demonstrated different shot types. The following information has been condensed from Oat’s very thorough, fun and informative workshop. 2014 Q3 SHOWREEL + from Oat Vaiyaboon on Vimeo. Although most of the workshop was fun and play, Oat also discussed some of the rules, regulations and issues that you may face when flying your drone. Firstly, you should know that you cannot fly your drone to collect video footage for coin, unless you have your RPA (Remotely Piloted Aircraft) Certificate. 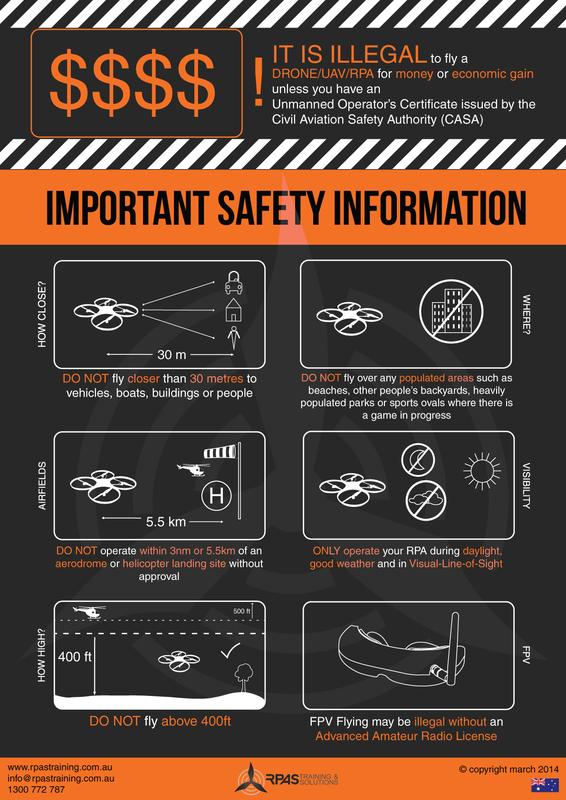 There is a whole list of rules and regulations about where and where you cannot fly your drone and some commonsense rules about flying your drone safely around people. I am going to provide you with some general information here but for more detailed, up-to-date and accurate information, you can find a list of rules and regulations here. What I found interesting in Oat’s workshop is how often and easily drones can just ‘fall out of the sky’ or how easily a pilot will lose control of the drone. Believe me, you don’t want to fly one of these babies above a crowd of people! The stories of drones crashing to the ground, came from both Oat himself and the bunch of aerial filming enthusiasts in the workshop. Always check props, battery, voltage, transmitter charge, FPV connections, signal and compass calib. Know your surrounding. Is it safe? Is it clear to fly? Are there people around? Can you get your craft back if it crashed. Another thing you need to watch out for with the drone is the battery. You really need to know how to (and how to not) handle the Lipo Battery because you could end up with an explosion on your hands! If LiPo swell, DO NOT USE or CHARGE! Once you get safety under raps you can enjoy the beautiful imagery and adrenalin-inducing joy of UAV aerial filming. Here are some photos of the fun-filled workshop. ONE LAST WARNING: UAV FILMING IS ADDICTIVE! Thanks to Oat for sharing your skills and knowledge with us and for the beautiful examples of aerial photography.